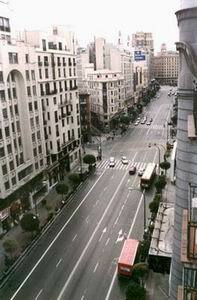 The Gran Vía, together with the Paseo de la Castellano, is Madrid's most famous street, mentioned in zarzuelas (Spanish operettas) and books and shown many times in films. It starts at the Plaza de Alcalá square and leads across the city to the expansive Plaza de España. Along this Great Way, as its name translates, there are hundreds of businesses - shops, stores, hotels, banks, restaurants, bars, cinemas and theatres - making this perhaps one of the most important commercial districts in the city. Its origins, in the 19th century, lie in the need to communicate the north-west of the city to the historic centre which was (is!) traditionally a chaotic maze of small streets making any journey across the city a laborious task. Several proposals for this Great Way across the city were presented, the definitive one being approved in 1901 and for which construction began in 1910. The project was divided into 3 distinct sections, and work was finally terminated in 1929. The street, and even its different sections, has had several different names over the years, changing most frequently in the years leading up to and during the Civil War. The dictator Franco gave it its most enduring name of Avenida de José Antonio in remembrance of the founder of the Falange party. 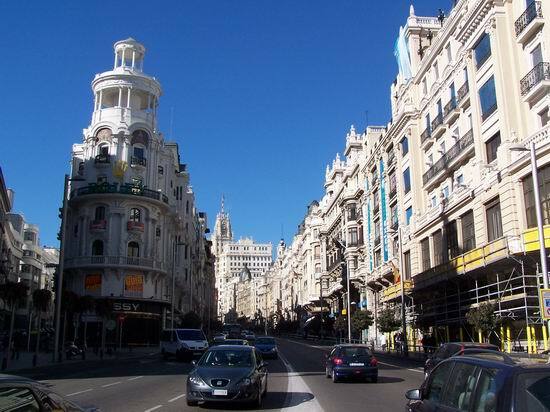 The definitive name of Gran Vía was given, democracy re-established, in 1981 by the then Lord Mayor, Enrique Tierno Galván (said to be Madrid's most loved Mayor!). This name harks back to how the locals originally visualised and named the project back in the 19th century, as the Great Way across the city. There are several important and interesting buildings located along the street, including the Edificio Metrópolis at the corner of Calle Alcalá and Gran Via - its grand columns holding decorative statues - and the Telefónica building at number 28 which is 88 metres tall and was Madrid's tallest skyscraper until 1953. It is always interesting to walk along the street and look to the rooftops of these impressive buildings, since many of them are lavishly decorated and often possess large statues, sometimes precariously perching on the ledge of the roof.